[Episcopal News Service] Presiding Bishop Michael Curry and the Rev. Jim Wallis of the Christian social justice organization Sojourners will co-lead a May 24 service at National City Christian Church followed by a candlelight procession to the White House. The events in Washington, D.C., are part of “Reclaiming Jesus: A Confession of Faith in a Time of Crisis,” an ecumenical Christian elders’ initiative launched in March to “reclaim Jesus” from those believed to be using Christian theology for political gain. The contemporary Christian religious leaders supporting this initiative believe the United States is in a political, moral and theological crisis. They are concerned with the resurgence of white nationalism, racism and xenophobia; misogyny; attacks on immigrants, refugees and the poor; the distortion of facts and consistent lying by the nation’s highest leaders; and moves toward autocratic political leadership and authoritarian rule. Since its release, other Christian leaders have requested to sign on to the statement. 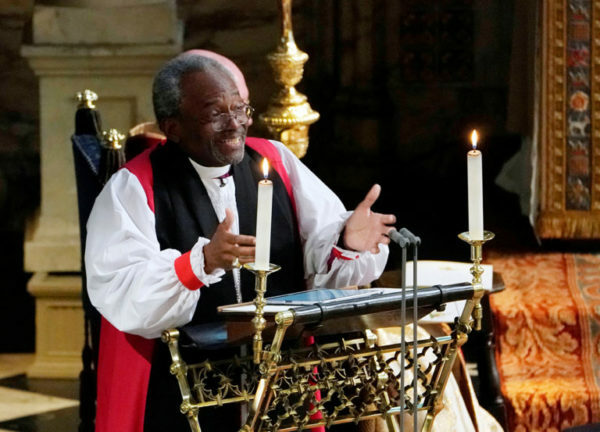 At the same time, Curry’s own profile has risen dramatically since he was chosen to preach May 19 at the royal wedding of Prince Harry and Meghan Markle. His sermon continues to generate praise this week as Curry turns his attention to Reclaiming Jesus. The May 24 service begins at 7 p.m. Curry and Wallis will address “faith in a time of crisis,” prayers and declarations will be offered, and the Howard Gospel Choir of Howard University will perform. It’s no coincidence that church leaders planned their trip to Washington to coincide with Pentecost, a time when early Christians took their faith to the streets and the public square. 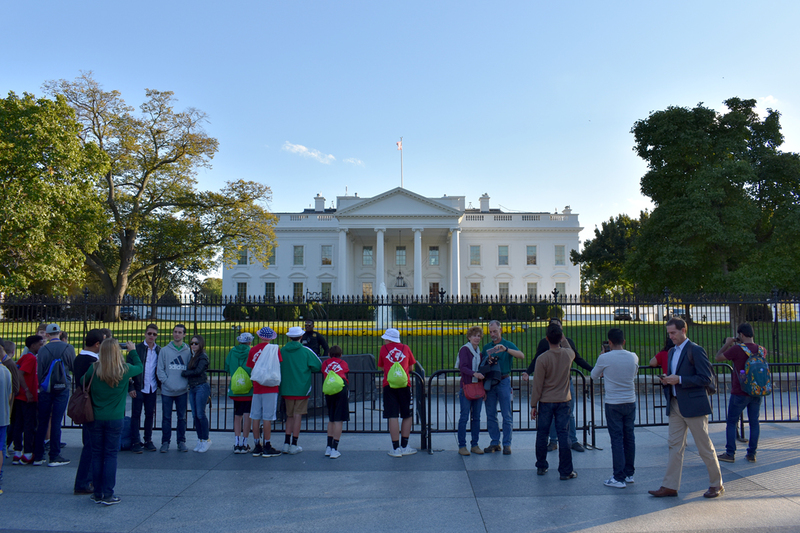 For the presiding bishop, however, the visit to Washington is more than a public witness. Curry will begin the day by offering Morning Prayer at the U.S. Capitol for members of Congress and their staffs. This is a continuation of the monthly Morning Prayer services organized by the Episcopal Church Office of Government Affairs and led by Episcopal bishops and clergy for more than a year. Following Morning Prayer, Curry is scheduled to meet with lawmakers from both parties and with Republican leaders to share the church’s values and look for points of agreement on issues ranging from refugee resettlement to higher education and criminal justice reform. The Episcopal Church maintains an official presence in the capital; its Office of Government Relations – housed on Capitol Hill – carries out the church’s nonpartisan, values-based agenda. Every three years, the Episcopal Church’s General Convention meets to conduct church-related business and to discuss and pass legislation ranging from revisions to the Book of Common Prayer to resolutions supporting criminal justice and immigration reform. Episcopalians can join the Episcopal Public Policy Network to become involved in this work. Incidentally, the United States has a long history of political leaders from the Anglican tradition, starting with President George Washington and many members of first Congress in 1789. The Episcopal Church’s prominence on Capitol Hill has been eclipsed by other denominations as the country has diversified over more than two centuries, though dozens of members of Congress still identify as Episcopalians or Anglicans. Today, at least 38 of the 535 citizens serving in Congress identify as Episcopalians: 22 Republicans and 16 Democrats. In November 2017, Episcopal News Service interviewed several Episcopalians who serve in Congress to report on the range of ways faith influences lawmakers’ public service. – Lynette Wilson is managing editor of the Episcopal News Service. She can be reached at lwilson@episcopalchurch.org. Will the Pope attend the march with our Bishop? They both share the same opinions and admiration of our United States leadership. Will Michelle and Chicago’s Rev. Wright join in? They both share the same estimation of the United States as a country and would seem to complete a fitting counterpoint. I suspect this will not be a membership drive for our Episcopal church. Too bad the Republicans in Congress who claim membership in the Church don’t take the Baptismal Covenant to heart and let it guide them as they do the business of the people that they were elected to do. Dennis Kucinich was asked at a labor breakfast here in Vancouver why the “right wing” seems to own the Bible. Kucinich’s quick reply was, “We should take it from them, open it up, & read it to them!” Making the rich richer & destroying the environment does not fit with Jesus’ words to love our neighbors as ourselves. I wish we had known about this earlier and organized similar demonstrations/events in every state capitol on the same day…a nationwide Reclaim Jesus! What about Israel and the murder of 60 Palestinians? The mainstream media continues to lie to us we need to STOP all these wars!!! MLK was so right about Vietnam also. Thanks for the fight!! The Bible is for all wings, is unlimited to everyone. The more knowledgeable we are and practicing the word of GOD the better. Better for our country and for our churches and the schools. Who is using Jesus for there own purpose. Certainly not Donald Trump. He did go to.Church Christmas eve & I never saw a single news report. If Barack Obama went to Church it was widely reported. Apparently you really wanted the Clintons back in the White House. This President has done for his.black & brown neighbors he got them a job! I thank God daily for our church leaders who are calling, as Jesus and the Old Testament prophets did, for justice, for mercy, for compassion, for truth to an immoral leadership. Actually I didn’t want either one of them but given a choice I’d have never voted for the Manchurian Candidate. Please don’t sing the praises of Trump as a champion of people of color, he’s used them to bring out the unspoken but very real racist DNA that exists in most whites in this country, whether they will admit to it or not. And it helped him get elected. Yes the Dems ran a bad candidate and a bad campaign but when you look closely there isn’t a dimes worth of difference between them and the GOP as George Wallace pointed many years ago. If the Episcopal Church is going to survive, we need to stop condemning people (on both the right and the left) who don’t agree with our political opinions. Intolerance of the opinions of others is the definition of bigotry. 1. Rejection of “White Nationalism and Racism” in politics. Not clear if it includes the violence and racism perpetrated by organizations such as ANTIFA and Black Lives Matter. Isn’t singling out white people racist or is this just a another slight at the current administration? 2. Misogyny in culture and politics. Are we not seeing public, Hollywood and political abusers of women being outed and charged with crimes? What else is the church looking for here? 3. “How we treat the hungry, the thirsty, the naked, the stranger, the sick, and the prisoner…..” Code words for amnesty for DACA and illegal immigrants, open borders and unfettered immigration, social justice, prison reform and the list of grievances goes on. 4. “We reject the practice and pattern of lying that is invading our political and civil life.”. Not sure what this means without examples. Politicians have been lying to us since the dawn of time. 5. “We reject any moves toward autocratic political leadership and authoritarian rule. … They raise deeper concerns about political idolatry, accompanied by false and unconstitutional notions of authority.” Autocratic = tyrannical or dictatorial. Authoritarian = same thing. Another shot at the current administration. How soon we forget what happened over the last 8 years with a “pen and a phone”. 6. “We reject ‘America first’ as a theological heresy for followers of Christ.”. There is so much to be done here in America. This country need to get its house in order before it “goes into all nations making disciples.” People cannot afford healthcare, veterans wait moths for care, young people are not coming to church, there’s violence in our large cities, we have an increasing homeless problem, a drug problem, children go hungry everyday, nearly a million babies are being aborted in this country each year and the list goes on. Perhaps if we make disciples here at home we could solve some of these problems. In the meantime we still send billions over seas in foreign aid. This summary of rejections and affirmations is another Progressive wishlist vailed in flowery language with no suggestions or plan on how to achieve the desired objectives so its just another march to appease those that support the liberal agenda. It’s exhausting to watch how these overpaid representatives of the church use our money that we contribute to move their political agenda in the Name of Jesus. From the comments I’ve seen here its hard to deny that this is nothing but a slam on the Republicans and the Trump administration. Not all of us in the Episcopal Church agree with you. The 2019 budget to be discussed in the upcoming convention is considering waivers for 17 Diocese that appear to not be able to meet their financial commitments to the EDUSA. The number of waivers needed will surely increase as more members tire of the church’s incessant political activism and leave the church. Bill, since you have pointed out to us all that’s wrong with the Church, do pray tell, enlighten us as to what it is TEC should be doing in the world that would earn the respect of you and other like-minded individuals? Richard, thanks for your question. My comments were not to meant illustrate “everything that’s wrong with the Episcopal Church” but rather what I see as wrong with the church leadership. This latest march is just one more example. As a matter of fact. I’m happy. with the church where I worship. I’m happy with my church family, our rector and the work we do in the community. You see, I view the leadership of the ECUSA similar to the way I view the Federal Government. Both are organizations that produce no revenue on its own but instead takes it from others. In the case of the Federal Government, we have no choice but to pay our taxes, not so with the EDUSA. We can choose not to contribute and hopefully those that do not agree with the politics of the church will discontinue to do so.. The income for the EDUSA is estimated to be $128M assessed from small churches like the one I attend, money we could use to pay our rector fairly and use to do more work in the community but instead we are forced to pay homage to our local Diocese and in turn the EDUSA. The EDUSA is a bloated political lobby organization that promotes a liberal/progressive agenda using our contributions. Not all of us are liberals. You can argue this point but the reality is those of us that are not do not have much of a voice on how our money is spent above the local level. Personally, I would feel much better if the church would stay out of politics, reduce the size of the Diocese, especially the Office of Government relations and its Episcopal Public Policy Network for a savings of around $2.5M for starters. I guess I just don’t see the value we get for our dollars. Hopefully, I’ve answered your questions. I doubt you’ll be satisfied with my answers since you probably stand in the ranks of those that are happy with how the church is run. Having never disclaimed Jesus, I don’t feel any need to reclaim him. But it sounds like others are trying to find their way home. That may turn out to be a good thing. Bp. Curry dropped about 75% in my estimation after his otherwise uplifting sermon in Windsor with this “reclaim Jesus” schtick. ie to “reclaim Jesus from those believed to be using Christian theology for political gain”. (Name ’em, Bp. Curry – don’t be coy). In a CNN interview with Bp. Curry it was suggested this DC “protest” was in opposition to “white nationalism”, but he won’t say that openly. He apparently is a closet Al Sharpton. He obviously has issues with Trump, who is a member of Bethesda by the Sea in Palm Beach. Curry is a showboat, unfortunately. I had hoped he was better than that. So according to Richard Warren racist DNA exists in the majority of white people in this country. Well I guess if Mr. Warren says it, it must be true! What an incredibly judgmental, self-righteous, unchristian, and frankly, dumb thing to say. It amazes me how progressives can engage in this kind of rhetoric and then have the nerve to accuse conservatives of being divisive! Let me assure Mr. Warren as well as den mark wichar and others like them that Christ doesn’t consider you one iota better than the people whose politics you disagree with. You may consider a Trump supporter beneath you as a human being but our Lord most assuredly does not. And no, I didn’t vote for Trump. (Or Hillary.) John Hobart is spot on when he says intolerance of other people’s opinions is indeed bigotry. Spare me, please, of your righteous indignation. Ever heard of slavery, white priveledge, white superiority, Jim Crow, mass incarceration, Emmit Till? Trump’s appeal to the racist under current in the white populous is one thing that helped elect him. I’m always amused at the reaction of a white person when one suggests that they might be a racist, the hair stands up on the backs of their necks and the defensiveness comes out in full blush. People of color in this country are still being marginalized, scapegoated, even persecuted to make whites feel how much better they are than their “colored” brothers and sisters. Most of us white folks in this country, myself included, are tainted by the institution of slavery in one way or another. How many honest conversations have you heard or been engaged in when racism is the subject, not many I’d wager. So you’re not a racist? OK if you say so. Richard, I took some time to think about your challenge to me regarding what I would like TEC to do in the world. Here’s what I’d like to see. TEC supports the Palestinian’s in the Israeli/Palestine conflict. Israelis protecting their borders kill 50 “peaceful” Hamas demonstrators and some Palestinian citizens burning tires and throwing rocks, molotov cocktails at Israeli troops. TEC: response: Outrage. Meanwhile Hamas fires rockets into Israel killing civilians and children. TEC response: Crickets. Christians abroad are being persecuted, their homes and churches destroyed, some are murdered for their faith. TEC response: crickets. So you ask what I would like TEC to do in the world. I would like to see the hypocrisy and bias from the church ended. “Take the Baptismal Covent to heart” and apply what it preaches to all people not just what suits it’s narrative. I can vent elsewhere about our leaders in government so here is where I call out our Church leaders, our PB in particular, who are every bit of what they claim to be against. Our “loving” and “inclusive” Episcopal Church is often neither. This is a vailed political statement against the present administration. It would have been better to sit down and discussed this with the President. I am sure he would have given the group time to do so. He was recently at the National Cathedral. If Rev. Billy Graham were alive I doubt he would have found this the appropriate manner to proceed. Try working with the President than against him. Dialogue instead of protest. The term immigrant was used and no one has an issue with legal immagration. We cant afford to allow the flow of drugs to kill and enslave our childeren. I am afraid you may have divided many of your congregations with this action. I was so hoping the Bishop was going to use his recent world stage to stay on topic with love. This protest and the words I read were a bit over the top. I was also hoping for him to grow the church but he may have struck a blow to it instead. It seems presiding Bishops have a habit of dividing the church by pushing personal agendas. I hate I had to write this but and my love for god is not effected. Its man that has the issues. B.D. you are spot on but don’t expect any reply from the Church. The progressives in the Church hierarchy will do what they always do with comments like yours – ignore them. One wonders whether quasi-leftist-evangelical Bp. Curry is seeking, with his “Reclaim Jesus (from those who seek to use Christianity for political purposes)”, to counter Franklin Graham’s authentic “Decision America” (currently known as “Decision California”) camp meetings currently occurring daily throughout California until the June 5 California primary. Recall that Graham conducted such gatherings in all 50 states prior to Trump’s election. Who knew there was a political connection ? Two days ago in Oxnard, CA Graham’s evening camp meeting was filled with liberal SEIU workers from throughout Ventura County. Apparently makes the libs like Bp. Curry, Sharpton, Obama and Valerie Jarrett (now Obama’s tenant) nervous. I largely agree with Bill Louis. I’m a 60 year old cradle Episcopalian. A lot of my ancestors going way back are likewise. Being gay I’ve largely dropped out of the church. Being gay doesn’t really fit the Christian lifestyle. I consider myself to be a agnostic atheist. Christopher Hitchens said ”I’m an atheist, but a protestant one”. He detested the Catholic Church. I’d say the same only I’d say I’m an Anglican agnostic atheist. Anglicans mix reason with scripture. As far as ending the occupation of Palestine, it isn’t totally a left/right issue. I think Israel is handling the situation terribly, but I support them strongly. There needs to be a jewish State. As far as gay marriage and gay clergy are concerned, I don’t know many gays who really care. I think in the future a lot of mainstream churches will marry gays. The internet has changed everything. Kids grow up very early now with web access so easily available. There are no needs for a lot of those little talks anymore. I have been with my partner for 25 years; we aren’t interested in marriage. I think marriage is a tacky institution. It’s all but disappearing in Scandinavian countries. Louis Farakhan and his Nation of Islam racist rantings isn’t mentioned in the Statement. Black Lives Matter and Antifa aren’t mentioned in the Statement. Revealing. No matter the blogspot or the subject matter involving the Episcopal Church,the same names keep showing up to attack the Episcopal Church and it’s leaders.Shades of the ACNA counterfeit Anglicans? Everyone knows what people like Louis Farakhan stands for but Presidency is a different matter. There was a time when words of US President was taken for truth and the President behaved in a manner that maintained the dignity of the post. I suppose this is no longer the case which is why many governments and their leaders are having difficult time understanding President Trump. My knowledge comes from mainstream media and the news may not be factual. I attended the local Memorial Day service recently where the guest speaker was a former marine. I was aghast to learn from his speech the contempt that many universities and groups here in US have towards the American flag that they would rather not fly the flag. Obviously a powerful group of people are doing a good job of spreading hate and divisiveness in society. I wonder if this is what PB Curry and those involved along with him are trying to fight against.